"Toughen-up" your '07-Current Dodge Caliber with this retro "Bumblebee" style graphics kit. Available in a wide variety of colors, this six (6) piece easy-to-install kit is packaged with precut and contoured graphics for the Roof and Rear Quarter areas - NO TRIMMING required (except for models with Satellite Antenna option)! Overall side stripe width is 8" (20.32cm) and features a classic .25" (6.35mm) pinstripe at each side as shown. 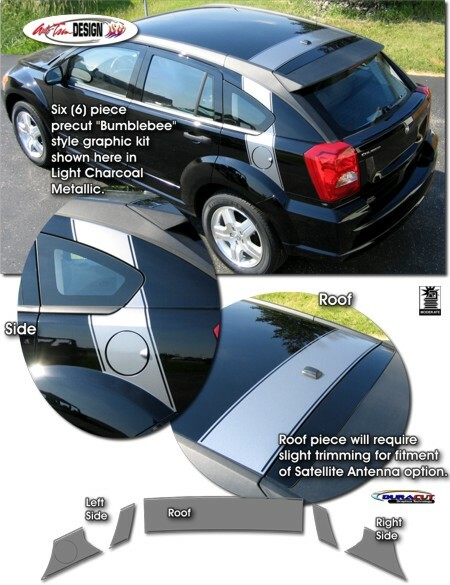 Graphic kit is specifically made for the '07-Current Dodge Caliber and will not fit any other vehicle.